"Understanding macromolecular motion is critical, but scientists know very little about it," said Vadim Backman, Walter Dill Scott Professor of Biomedical Engineering at Northwestern University. "Part of the reason is because we lack instrumental techniques to observe those processes." Now, a research team at the McCormick School of Engineering led by Backman has developed a new optical technique to study the movement of cells without using labels or dyes to track them. The innovative method has also revealed an undiscovered phenomenon that may play a role in the earliest stages of cell death. The team's insights were published on April 10 in the journal Nature Communications. 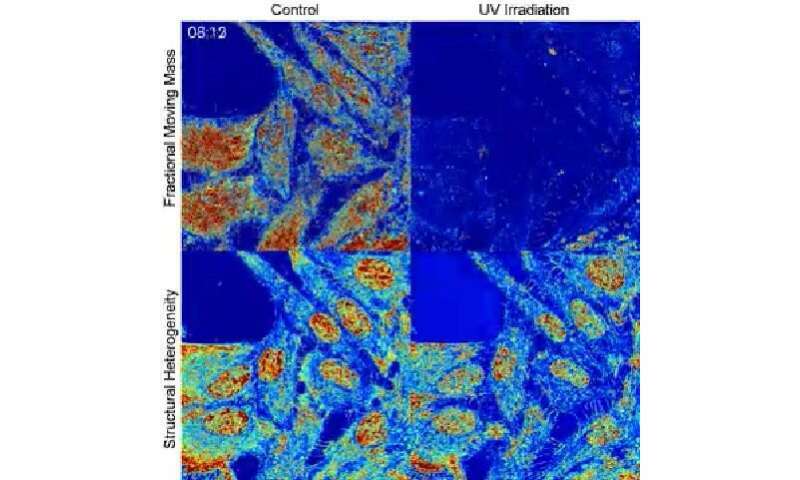 The paper is titled "Multimodal interference-based imaging of nanoscale structure and macromolecular motion uncovers UV induced cellular paroxysm." While scientists can currently track the movement of cells using molecular dyes or labels, the practice comes with limitations. Dyes are toxic and alter the behavior of cells before, eventually, killing them. Labels are attached to cells, can be toxic or result in photobleaching, and may alert the motion of the very molecules they label. The new technique, called dual-PWS, is label-free and can image and measure macromolecular motion without using dyes. Building off of a quantitative imaging technique previously created by Backman called Partial Wave Spectroscopy (PWS), the platform uses the interference and pattern changes from backscattered light to monitor both the macromolecular structure of cells along with their dynamic movement. "Critical processes like the transcription of a gene or the repair of damaged proteins requires the movement of many molecules simultaneously within a highly packed, complex environment," said Scott Gladstein, a Ph.D. student in Backman's lab and the study's first author. "As an imaging platform with the capability to measure both intracellular structure and macromolecular dynamics in living cells with a sensitivity to structures as small as 20?nm with millisecond temporal resolution, the dual-PWS is uniquely suited to allow us to study these processes." This time-lapse video compares the structural and dynamics (fractional moving mass) response in control cells in the left column to cells irradiated with UV in the right column. Cellular paroxysm can be seen in the top right quadrant, after about 11 minutes of UV irradiation. The researchers applied dual-PWS by studying the nanoscale structural and dynamic changes of chromatin in eukaryotic cells in vitro. Using ultraviolet light to induce cellular death, the team measured how the movement of the cells' chromatin was changed. "It makes sense that as cells are about to die, their dynamics lessen," Backman said. "The facilitative motion that exists in live cells to help express genes and change their expression in response to stimuli disappear. We expected that." What the researchers didn't expect was to witness a biological phenomenon for the first time. A cell reaches a "point of no return" during decay, where even if the source of the cellular damage is stopped, the cell would be unable to repair itself to a functioning state, Backman said. Using dual-PWS, the researchers observed that just prior to this turning point, the cells' genomes burst with fast, instantaneous motion, with different parts of the cell moving seemingly at random. "Every cell we tested that was destined to die experienced this paroxysmal jerk. None of them could return to a viable state after it took place," said Backman, who leads Northwestern's new Center for Physical Genomics and Engineering. The team is unclear why or how the phenomenon, called cellular paroxysm, occurs. Backman originally wondered if the movement could be due to ions entering the cell, but such a process would have taken too long. The uncoordinated motions of the cellular structures occurred over milliseconds. "There's simply nothing in biology that moves that fast," Backman said. He added that members of his lab were so surprised by the results, they joked that the phenomenon could be explained as "Midichlorians" leaving the cell, a reference to the chemical embodiment of "the Force" in the Star Wars films. While cellular paroxysms remain a mystery for now, Backman believes the team's findings highlight the importance of studying the macromolecular behavior of live cells. The more insights researchers can gain about chromatin, the more likely they can one day be able to regulate gene expression, which could change how people are treated for diseases like cancer and Alzheimer's. "Every single biological process you can imagine involves some sort of macromolecular rearrangement," Backman said. "As we expand our research, I can't help but wonder, 'What will we find next?'"